On Wednesday, February 10, Dr. Rajil Karnani came to the East Lansing campus to talk to the students in the MSRJ Elective about careers in academic medicine. He presented about the many ways to become involved in academia, and the variety of career pathways that academic medicine can offer. He covered the advantages and disadvantages to consider, along with the keys to success that he has learned over the years. Dr. Karnani also gave some personal anecdotes on his experience and some tricks of the trade that he wished he knew when he entered the field. Lastly, Dr. Karnani fielded questions from the 30 students who attended the lecture. 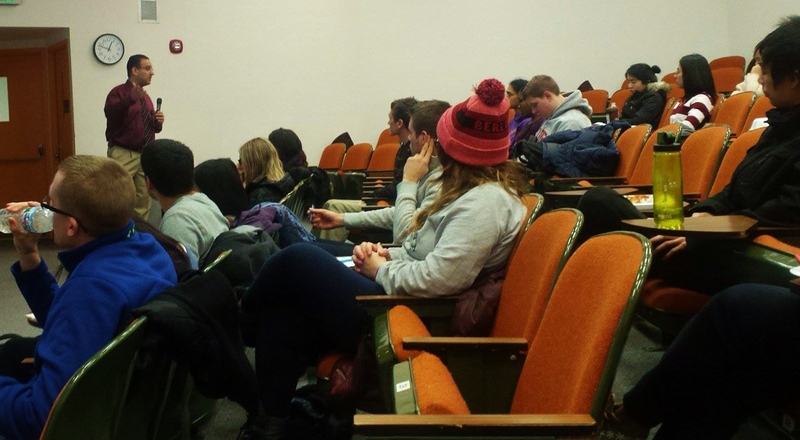 The students enjoyed the lecture and found it very informative, as careers in academic medicine are seldom talked about during our learning and training. Student question and answer session with Dr. Rajil Karnani. 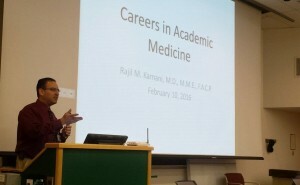 Dr. Rajil Karnani lectures to the MSRJ Elective students about pursuing a career in academic medicine.